It was the second week of driving on ice and snow for WRC drivers, as the first Norway Rally kicked off in the lake region of Hamar. At the first day's end, it was Finn Mikko Hirvonen (1:24:39.0) leading with a 15.5-second advantage over Ford teammate Marcus Gr nholm after eight special stages. France's Sebasti n Loeb again drew the spotlight by placing third, one spot behind his 2007 season nemesis, whom he leads by two points. 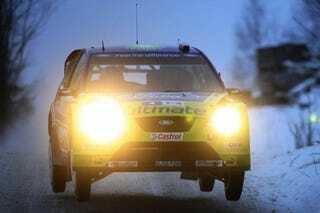 Local talent Petter Solberg placed fourth in his Subaru. Leg 2 Preview: Loeb's out. He hit a snow bank during SS12 (the ski jump stadium stage), and it took him 8 minutes to get free.